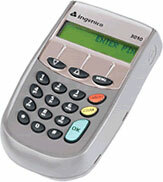 Ingenico i3010 - Pin pad terminal with multiple interface for use with Intuit QuickBooks POS only. Includes: i3010 PIN Pad (Part# RS-232-PC), USB cable, and Power Cable (Part# 6035-00063-0100). If you would like to use RS-232 cable you must order required power supply (Part# PE00732) and RS-232 serial cable (Part# AC00618), not included. See accessories. For use with Intuit QuickBooks POS only. Requires key injection in order to accept debit or credit card payments. Please call for more information.